So this has been our latest project - well, Jenny's project. I'm just the forced labour. In our never-ending search for space, she wants to clear out the garage for her stuff by putting the stuff that's there into this new shed. It's about three times the size of our old shed. 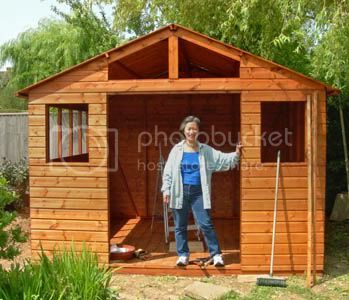 If you're interested, it's a 10'x10' "Waltons Groundsman Workshop" from Garden Buildings Direct. Quality-wise, it's so-so but it was pretty cheap. The panels are flimsy. I've warned the children not to play "Three Little Pigs" inside since they might blow it down. We need to cover the floor with plywood to make sure a heavy object doesn't fall and break it. "....a shed is to a man what a handbag is to a woman." Hey! I could build a log cabin at the bottom of the garden! That's interesting because the planning laws seem to be significantly different where we are (5 miles from you). In our district you can build an outhouse of up to 30m2 and the distance from the boundary doesn't seem to matter!